Knitterly Goodies from Fringe Supply Co. I recently decided to treat myself to a couple of small goodies from Fringe Supply Co. for my birthday. 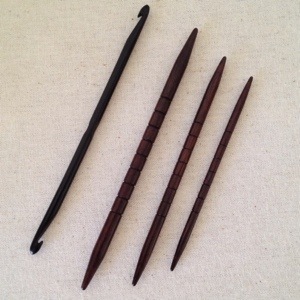 I snagged one of the ebony repair hooks (a double-ended crochet hook, really) because it is so much prettier than the silly pink steel one that’s always lounging in the bottom of my knitting bag. 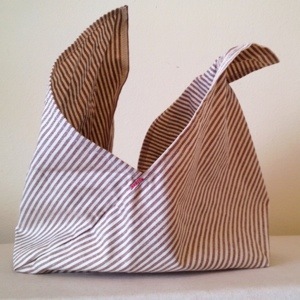 Speaking of knitting bags, I snagged a super cute bento bag in tan ticking stripe. I carry my knitting with me to work every day and having a small knitting bag that can be thrown into my purse or any other bag at a moment’s notice is what I’m looking for. I also grabbed a set of the ebony cable needles. I’ve wanted some of these for quite a while because I love that they are short and straight and have little notches in them to help keep the stitches secure. I recently finished knitting a project with SO MANY CABLES and decided that my old bent steel cable needle that I bought when I first started knitting was just too annoying to use for something with lots of cabling going on. I got so tired of it that I switched to a random 4″ DPN which was much nicer to use, but HELLO? These ebony cable needles are beauts. Had to have ’em. 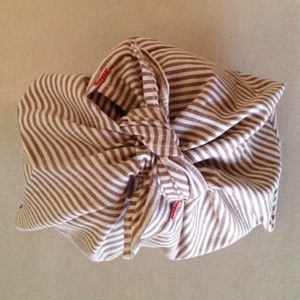 If you haven’t checked out Karen’s shop or even her blog, you should definitely do both.